Includes: Printed and bound manual of all forms, plus a data CD with all of the electronic files included in this package. Package is sent within 5 to 10 business days from purchase. To get the most out of your referral relationships, it’s important that you stay in touch with your referral sources and that you are “top of mind” when they need to refer a client to a qualified estate planner. This can be easily accomplished through something known as wholesale seminars or continuing education seminars (CE Seminars). It’s also known as something that estate planning attorney, Joseph J. Strazzeri, calls “Stewardship Marketing” (see Joe’s July 2014 Newsletter Article). And now, for the very first time, SC Institute is making available to the rest of the estate planning community its entire 290-page step-by-step manual on how to successfully set up your own events from start to finish. SC Institute holds hundreds of events throughout the year, including its Thursday Insights, The Gathering, Laureate Center for Wealth Advisors Meetings, California Forums, Practice Developer Programs for advisors, and FamilyCare Workshops and Family and Business Owner Retreats for clients, and much more! This Manual will give you absolutely everything that you will need to do your own events. From starting that conversation with a potential referral source, to setting up a date, time and location, to putting together the marketing piece, to providing continuing education for attendees, to following up after the seminar, and much more! It’s an all-inclusive guide to putting together seminars and events for your referral sources so that you can maximize your referral relationships! 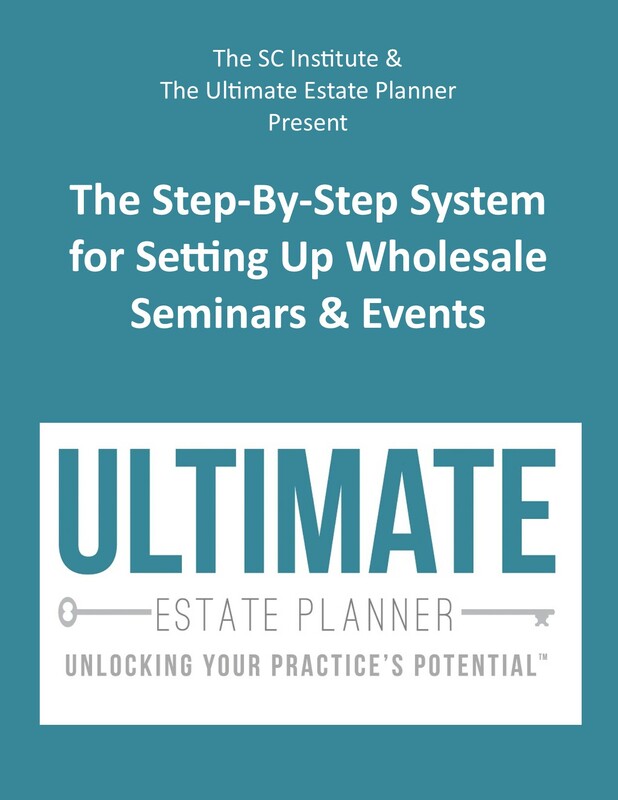 What’s Included in The Step-By-Step System for Setting Up Wholesale Seminars & Advisor Events?